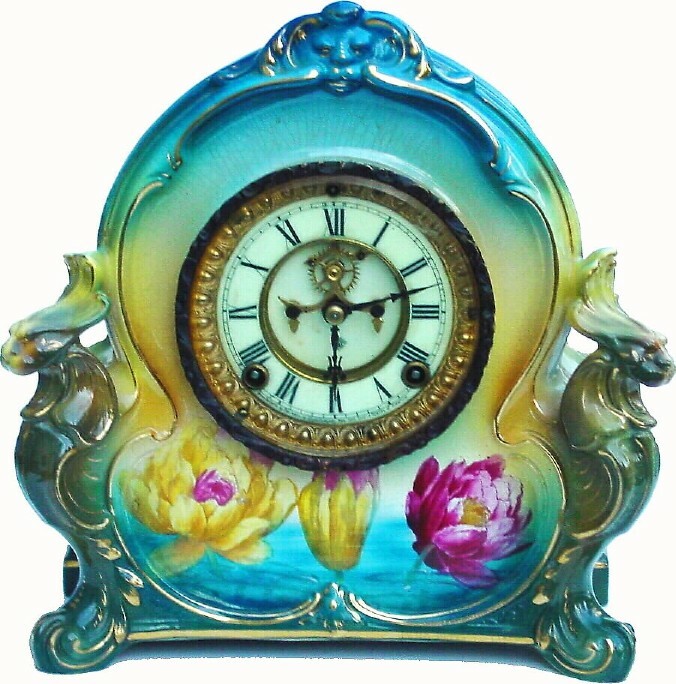 C.1905, Ansonia, La Charny, Royal Bonn porcelain china clock in excellent original condition. This is a multi color case, with dark green and the bottom, changing to yellow as it rises and ending in dark aqua at the top; the hand painted flowers are bright yellow and dark pink water lilies on a pond. The sides of the case feature griffins set at a 45 andNo.176; angle, the case open behind the griffin heads, allowing light to pass through. With good Bonn Trademark on the rear. Note: this very model is pictured on the cover of the new clock price guide from Robert and Harriet Swedburg. Height 11 1/2"